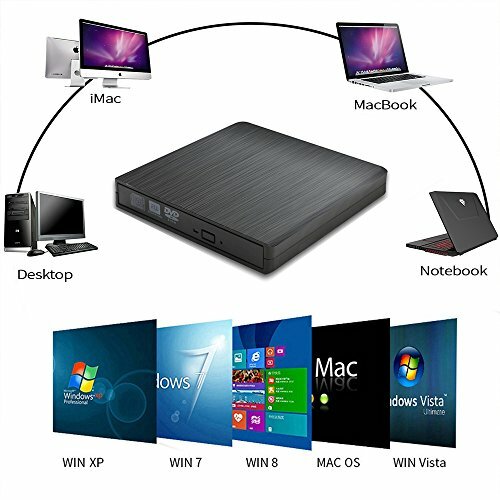 1、external cd/dvd drive for laptop USB 2.0 with the durable plastic case. 2、This optical drive can read CD-RW and DVD-RM,but it only can burn CD-RW not DVD-RW. for Sony, for HP etc. 【Portable】Dainty external cd/dvd drive for laptop is Slim, Light-weight,Easy to carry.Independent USB 2.0 interface can be removed after use. 【Easy to Use】No need to install drive with CD driver,no external power needed,Plug and Play,Daity CD Music Burner Work with Both Laptop & Desktop. 【High Speed】Adopt full-function original machine core, the speed of DVD read disk increases 70%, fully support CD/VCD/DVD all size. 【Stable & Durable】EDA voltage stabilization system, intelligent control of voltage and current, avoid excessive voltage cause CD/DVD drive cannot be use or damage the computer. 【Unique design】Silent cd rom drive external, reading disc.Increase vibration-proof function, effectively reduce noise.Anti-skid pad design to prevent the product from slipping down and damage.